At microscopic level we study processes by which monomeric proteins assembly into filamentous structures. We strive to understand how continuum properties of filaments arise from structure of and interactions between individual monomers. We are also developing new methods to directly engineer and characterize interactions between a pair of filaments. and we directly visualize and manipulate the structure of entire assemblages. We then quantitatively compare the observed phenomena with theoretical models. From techniques perspective the main focus of the group is on directly visualizing and manipulating self-assembling materials using optical microscopy. 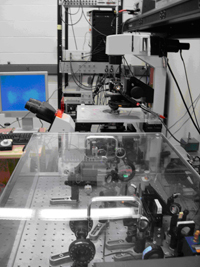 We have various optical microscopy setups including multi wavelength TIRF microscope capable of single molecule detection, time shared laser tweezers capable of measuring nanometer displacement and piconewton force, quantitative polarization microscope and many others. We are also developing electron microscopy methods to extend the imaging of our structure to lengthscales that can not be easily resolved with optical microscopy.